We were all chatting, arguing and joking. Sitting on a comfy chair, I looked all around me. 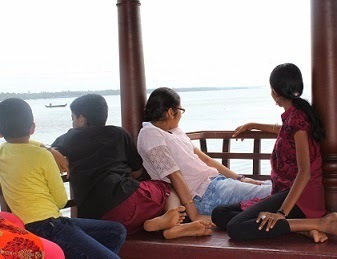 Savithri was sitting on another chair next to me, Kunjunni and Shanku were monkeying around, and Kunji chechi was admiring the view. We all were in the houseboat, by the way and the journey had not yet started. 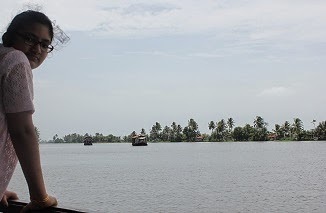 Vembanad Lake, the largest lake in Kerala, was beneath our houseboat. The boat, White Water Cruise, belongs to Savithri’s Valyachan and it was big and beautiful with 2 bedrooms, 2 bathrooms and a living room and was very open. You could see everything from everywhere. After an hour, we got bored sitting around and decided to play a game of hide and seek. Kunjunni was counting to 20 slowly, while me, Savithri and Shanku giggled and tried to find a hiding place. Savithri got inside the steam bath. I looked around but did not see any good hiding place in the room. So, I hid behind the open door of the adjoining bathroom. Shanku looked around and stood next to me. ‘’What are you doing?” I hissed. But Kunjunni had already finished counting. And as expected, he spotted us first. 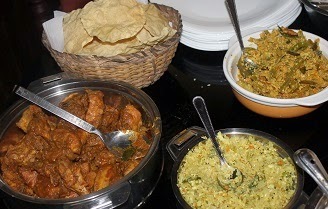 Breakfast was kappa and fish curry, served hot and delicious. 3 hours later Kunjunni reported “We are having fried Karimeen for lunch, along with chicken, rice, sambar and a variety of other curries which are hot and little bit spicy.” ‘How do you know all that?” I inquired. “Have you been in the kitchen?” “The uncles there let me try everything.” And sure enough, when he disappeared after a few minutes, me, Savithri and Shanku first checked the kitchen. The lunch was really, really yummy. 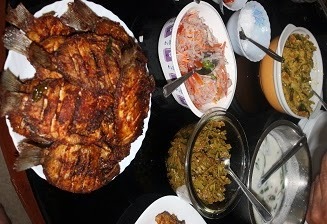 There were a variety of dishes placed on the dining table. And for dessert we had slices of pineapple, which were so sweet we ate a lot. “I ate 8 pieces.” I declared. “Well, I ate 10 and they were delicious!” laughed Savithri. In the evening, we had tea and banana fry. By then, my, Savithri’s and Kunji chechi’s hair was sticky and wet, so we went to the bigger bedroom with a huge mirror to comb our hair. We had some fun, trying to plait others hair. I and Savithri weren’t that good at plaiting but Kunji chechi could do it beautifully and very stylish so we let her do ours too. Altogether, this was a memorable trip which everyone enjoyed, from the young to the old. Or in other words, from Shanku to our grandparents.